It is starting to look like a serious quilt here. There are now 21 of the Arrowhead blocks sewn and 4 of the Old Italian blocks for a grand total of 25. . The nice thing about making the Italian blocks is that when you cut them out you get pieces for two blocks - a positive and a negative version. So I need to concentrate on making those at this point. The Twenty Five made so far. 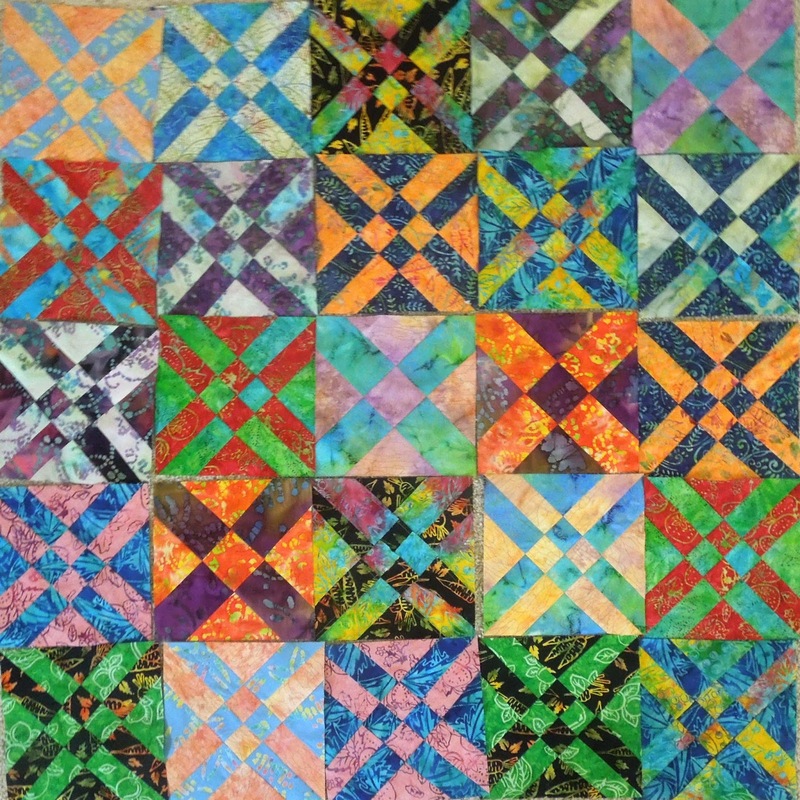 Those multi color batiks can make the blocks look distorted a bit. I find that interesting - but I am not changing them. I have other things going on now also so it may be a couple of days before I get back to these. Meanwhile, have a wonderful weekend. Comments are welcomed. I will reply when possible unless otherwise stated. Of course if you are a "No Reply Blogger" - I can not reply. What a fun-looking set of blocks! I know you love batiks, too! Can't wait to see it finished. It is looking great, Gene. So the Italian blocks are serendipitous...lucky, no waste! Pretty! Have a great weekend. Loving the batiks, and no, don't ever change something interesting! I love the look of the two blocks together. Do you send your tops out for quilting or do you do it yourself Gene? Progress - i think I am in love!